Hey Mom! Is the Babysitter Here Yet? Do you remember that classic ad headline from the history of Champions of the Galaxy? 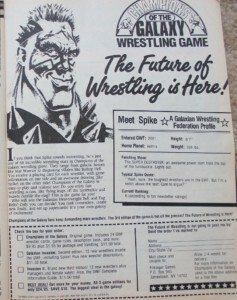 The ad appeared in 1988 and heralded the coming of SPIKE to the GWF! 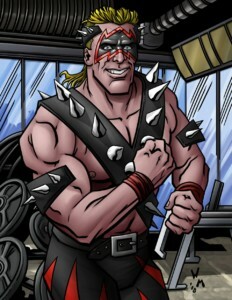 Spike was the first Gladiator recruit and became an all-time favorite among the fans. The ad appearing below is a different ad from the “babysitter” one, but still featured SPIKE in the pages of Pro Wrestling Illustrated magazine. SPIKE was always one of the great advertising stars of the GWF! ← WATCH OUT LEGENDS, THE VACHON BROTHERS ARE IN TOWN!